We are a leading Manufacturer of electro magnetic pulley from Chennai, India. Especially designed to suit specific application requirements of clients, our Electro Magnetic Pulley provides the most effective solution for metal recovery for the head pulley. 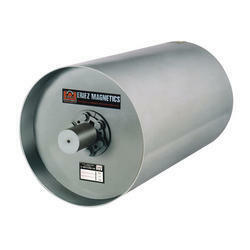 The deep electro-magnetic field of this product enables in easily extracting tramp ferrous metals from the conveyor. Widely utilised in quarrying and recycling industries, our products have helped us garner a rich clientele in the market. Looking for Electro Magnetic Pulley ?